On February 23, 1993, MGM celebrated a “topping off” ceremony with the placement of the last panel of emerald green glass hoisted onto one of the 30-story hotel towers. A total of 5,005 green balloons were released, each containing a gift certificate valid for one complimentary stay in one of the rooms. When the latest MGM Grand opened on December 18, 1993, it was owned by MGM Grand Inc. At that time it had an extensive Wizard of Oz theme, including the green “Emerald City” color of the building and the decorative use of Wizard of Oz memorabilia. After entering the casino’s main entrance, one would find themselves in the Oz Casino and facing the “Emerald City”. Dorothy, the Scarecrow, the Tin Man and the Cowardly Lion were seen in front of the city. The “Emerald City” attraction featured an elaborate yellow brick road walk through. Complete with a cornfield, an apple orchard, the haunted forest as well as audio-animatronic figures of the Scarecrow, Dorothy, the Wicked Witch of the West, the Tin Man and the Cowardly Lion. It would end at the door of the city, leading inside for a performance of “The Wizard’s Secreats”. When the MGM Grand began its extensive refurbishment in 1996, the Oz Casino was the first to go. The Emerald City was completely demolished, and the “Emerald City Gift Shop” was moved to a new shopping section of the casino. The store remained open until early 2003. 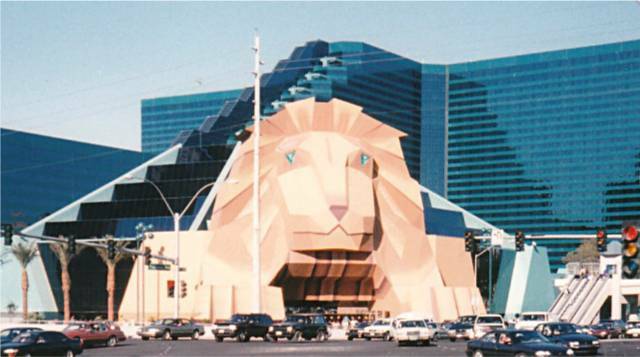 Originally, the main entrance on the Strip was inside the mouth of a giant cartoon-like version of MGM’s mascot, Leo the Lion, but this entrance feature was changed to a more traditional entrance; many Chinese gamblers avoided the casino or entered through the back entrance, due to the feng shui belief that entering the mouth of the lion was “bad luck.” In 1998, a large bronze statue of Leo was added above the entrance to keep with the MGM Lion theme, while not scaring away their more superstitious guests. 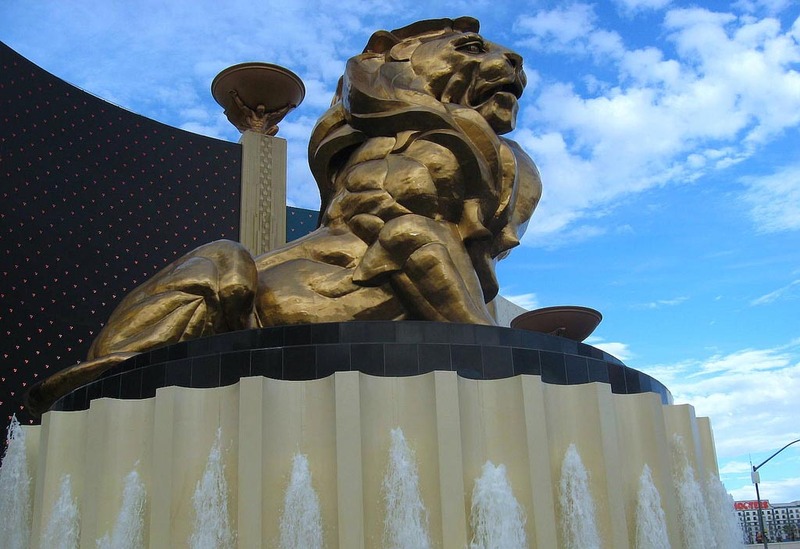 The statue weighs 50 tons, and at 45 feet (14 m) tall, on a 25-foot pedestal, is the largest bronze statue in the U.S.
A monorail was built to connect the MGM Grand to Bally’s in 1995. The coming out party for the monorail on behalf of Bally’s consisted of showgirls and guys from Jubilee helping the groups to the monorail. Characters from the Wizard of Oz greeted the groups on the MGM side. The track was later updated to became the southernmost section of the Las Vegas Monorail. The station was refurbished, the trains were replaced with Bombardier M-VI’s, and the track was extended beyond the southern station to provide for track switching for the trains as well as a starting point for a potential future southern extension to the monorail line. In 2000, in an attempt to appeal to a more “mature” clientele, the hotel underwent a major renovation and almost all traces of the “Oz” theme were removed. The theme is now more of the Art Deco era of classic Hollywood and the hotel started billing itself as The City of Entertainment. More recently, the resort has used the phrase, “Maximum Vegas” referring to the vast amount of activities MGM Grand offers its guest. In 2005, MGM opened the “West Wing,” a renovation of the original Marina Hotel rooms. 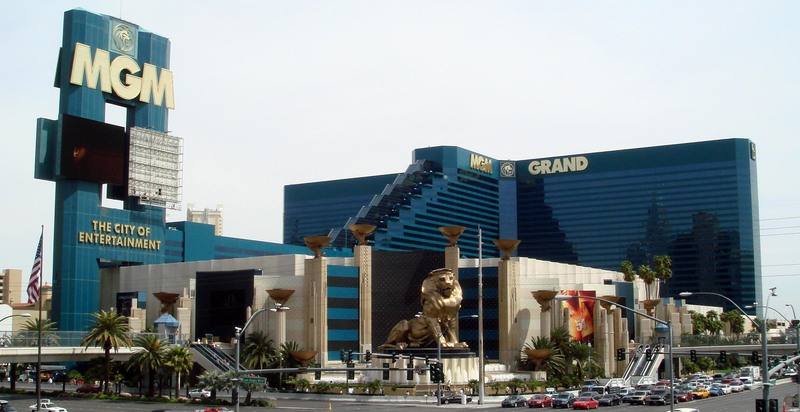 This article uses material from the Wikipedia article “MGM Grand Las Vegas”, which is released under the Creative Commons Attribution-Share-Alike License 3.0.